This post contains affiliate links. This means that if you click through and decide to make a purchase, the price you pay stays the same but I might receive a small commission that goes back into keeping the blog running. Thank you for your support. When I was in my early twenties, I went to an Indian wedding with my boyfriend at the time. It was in a hall just outside Leicester. It was all kinds of beautiful. The canopy where the bride and groom sat, the constant music, all the families coming together - and the lunch. It was amazing. Once the ceremony had finished, we were summoned to long trestle tables where ladies came around and kindly ladled out dark, aromatic curry into bowls for everyone. The curry was rich and dark, and full of meat and bones. Nothing wrong with bones, they add a lot of flavour. 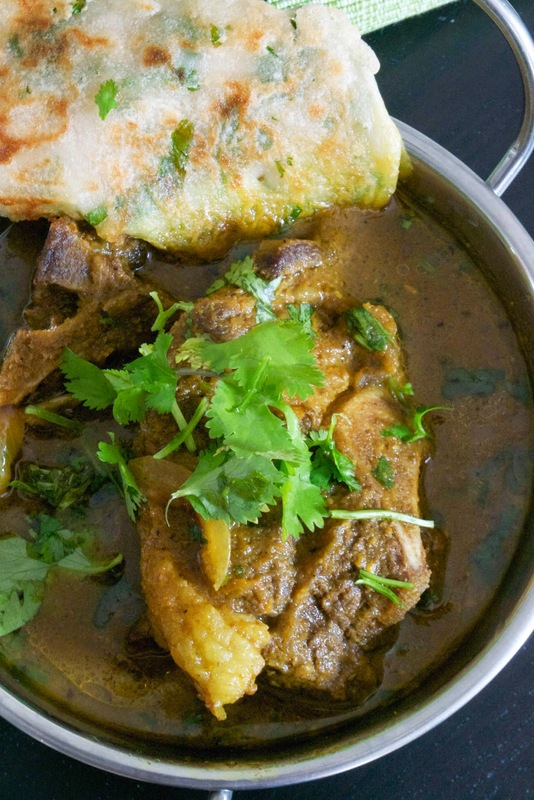 That curry, for me, is the benchmark of how my perfect curry should look, feel and taste. I still remember it now. It should be dark, with a thick sauce - with slow-cooked, tender meat that clumsily drops off any bones that happen to be lurking within. The meat should be preferably beef or lamb. And as well as having a bit of spice (but not too much that you're fanning your open mouth and gasping for water), it should be aromatic. In other words, it should have other flavours, too, other than HOT. It is a challenge to create a curry without nightshade spices (paprika, chilli) or seed spices (mustard seeds, garam masala). But this one really did hit the spot. And when Farmer's Choice, an online butcher that specialises in free-range meats, sent me some goat to cook, I knew it was going into a curry. When I posted this on Instagram, people loved it. There were compliments mostly about the sauce - about its colour and texture - nice and dark, due to the fact that there's no coconut milk in it and a few colourful vegetables blended in to colour and thicken it. In fact, this curry is absolutely coconut-free. 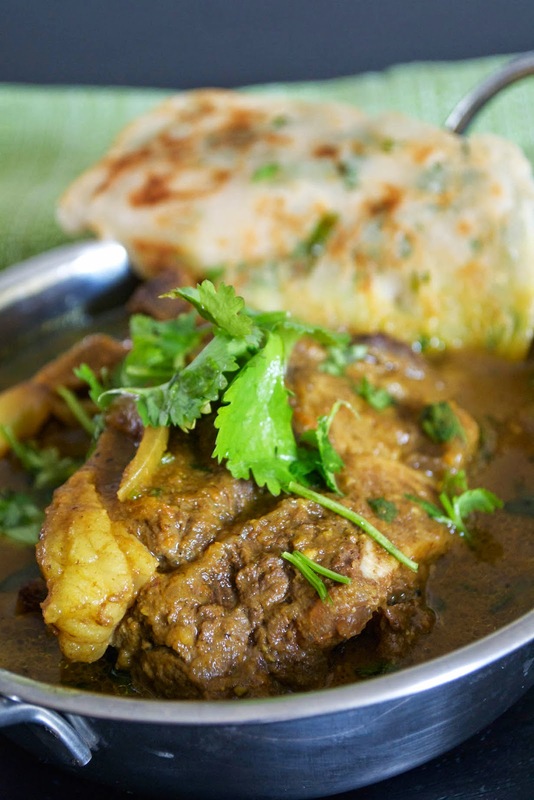 It does contain lean goat meat, beautiful onions, healing turmeric and beef broth. Basically, there's a lot of good things in this curry. You're going to love it. I did cook the goat very slowly, as it's very lean - but it didn't melt down as diced lamb or beef would. Maybe if I'd cooked it slower (say, at gas mark 2 for 2-3 hours it might have melted down more). But never mind - the goat meat was still tender and had a flavour like lamb but not as strong, and much less fatty. 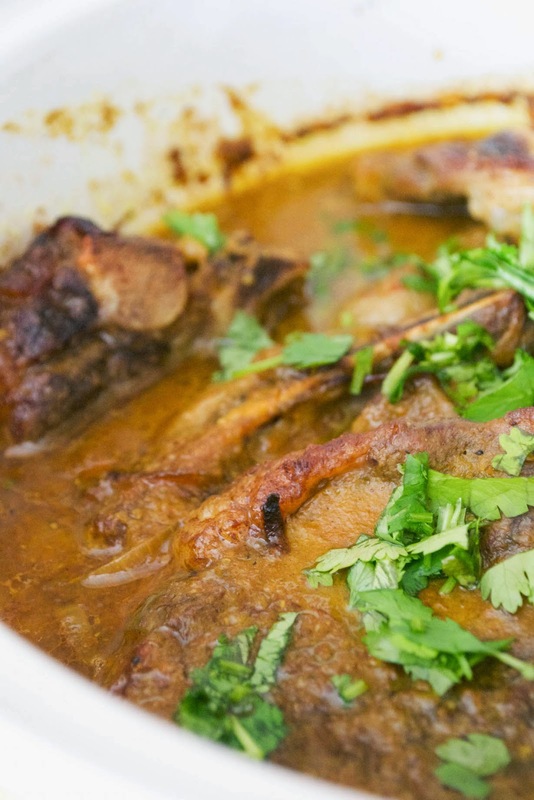 If you can't get hold of goat, a good stewing cut of lamb or beef would be perfect, too. And the naan bread, also in the pic? That's AIP too - get the recipe for these AIP chapatis at Adventures in Partaking - I added some chopped coriander leaves to the batter before frying. Set the oven on to gas mark 3/325F/160C. Heat the oil in a frying pan and fry the onions gently until golden and beginning to brown. This will add colour and flavour - but make sure they don't burn. Once the onions have coloured nicely, add in the garlic, the ginger and a good pinch of salt and stir until softened and aromatic. Stir in the carrot and the chopped beet, along with the cinnamon, cloves and turmeric and then pour in the stock or bone broth and leave to simmer for 3-4 minutes. Pour the sauce, scraping down the base and sides of the pan, into a large bowl. Blend until smooth. In the now empty pan, brown the goat meat in a little more avocado oil. Tumble in the onion slices and fry until golden. Once the meat is browned, lift it (and the onion) out and place in the base of a casserole dish with a lid. Pour over the blended sauce and replace the lid. Slide into the oven and cook for 2 hours. When you're ready to serve, taste and check for seasoning and then ladle out the curry into bowls, scattering the fresh coriander leaves over. I've entered this recipe into Phoenix Helix's AIP Recipe Roundtable.